Compatible with Apple iPad 9.7 release in 2017. Model number is A1893/A1954 on the back cover,,the 2018 new iPad with the support with Apple Pencil,also compatible with iPad 5th Gen 2017 9.7 Inch(A1822/A1823). Well built to protect your Apple Tablet device for the years to come. Built- in Apple Pencil Holder - Using your Apple Pencil whenever you want and never get lost. The special slot is designed to grab your pencil firmly and put out effortlessly. AUTO wake/sleep - Automatically wake or puts 2018 iPad 9.7 Inch tablet to sleep when the lid is opened and closed. Premium Material - Made of PU and TPU, soft microfiber lining and soft backshell, the case provides total front-and-back protection against fingerprints ,dust and scratches. Tri-fold Stand - Built-in magnets,fold into a stand. Tri-fold front cover with dual standing positions for enjoy the most comfortable keyboard-typing and movie-viewing with a viewing angle that is different from tir-fold. Slim and protective - Ultra slim design without adding bulk,1 mm wider than inner back plate, the case protects your iPad from daily wear& tear and accidental drop. 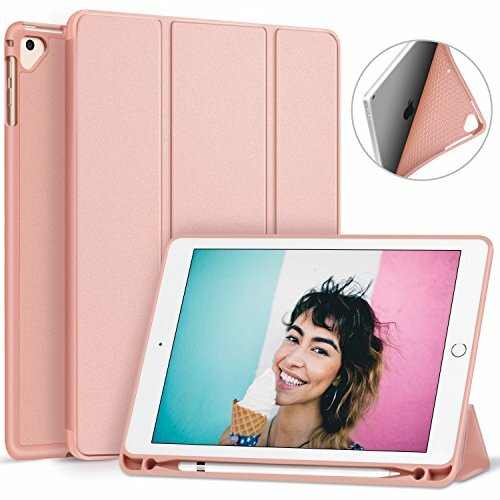 Customer Care-Satisfaction we provide a lifetime service .If you have any dissatisfaction for iPad 9.7 case that you bought in Ztotop, you will receive a replacement or refund. Designed for iPad 2018 - Exclusively designed for 2018 New Apple 9.7 Inch iPad (A1893/A1954),also compatible with iPad 5th Gen 2017 9.7 Inch (A1822/A1823). leave a place for Apple Pencil. Automatically wake or puts 2018 Apple iPad 9.7 Inch tablet to sleep when the lid is opened and closed. Apple Pencil Holder Features - Using your Apple Pencil whenever you want and never get lost easily to carry your Apple pencil with your device. (Apple Pencil is NOT included). The unique hole makes it easy to pull out the pencil. Full Body Protection Design - Soft TPU back shell protect your iPad 9.7 from shocks, drops and impacts. Soft microfiber lining with PU leather exterior, prevent your tablet from scratched. Stable Tri-fold Stand - Built-in magnets, fold into a stand. Tri-fold front cover with dual standing positions for enjoy the most comfortable keyboard-typing and movie-viewing. Powerful magnet secures the case closure, easy snap on and off.